Western blot analysis of extracts from Raji and MCF7 cells, untreated (-) or treated with TPA #4174 (200 nM, 30 min; +), using Phospho-Bim (Ser77) (D4H12) Rabbit mAb (upper) or Bim (C34C5) Rabbit mAb #2933 (lower). Immunoprecipitation of Phospho-Bim (Ser77) from extracts of MCF7 cells treated with TPA #4174 (200 nM, 30 min), using Rabbit (DA1E) mAb IgG XP® Isotype Control #3900 (lane 2) or Phospho-Bim (Ser77) (D4H12) Rabbit mAb (lane 3). Lane 1 is 10% input. Mouse Anti-rabbit IgG (Conformation Specific) (L27A9) mAb (HRP Conjugate) #5127 was used to avoid recognition of rabbit IgG heavy and light chains by western blot. 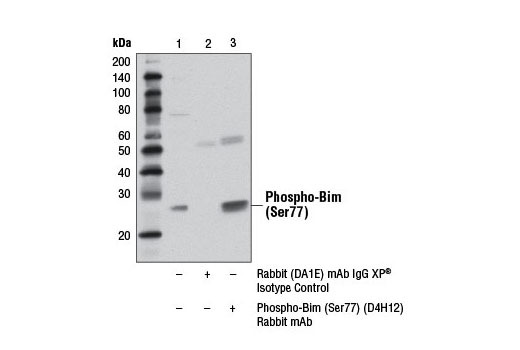 Phospho-Bim (Ser77) (D4H12) Rabbit mAb recognizes endogenous levels of Bim protein only when phosphorylated at Ser77. 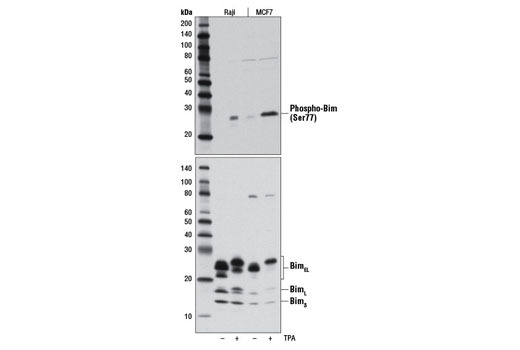 Monoclonal antibody is produced by immunizing animals with a synthetic phosphopeptide corresponding to residues surrounding Ser77 of human Bim protein. MAP kinase dependent phosphorylation of Bim at multiple sites, including Ser55, Ser65, and Ser73 in mouse (Ser59, Ser69, and Ser77 in human), can promote proteasomal degradation of Bim and inhibition of apoptosis (10). Hübner, A. et al. (2008) Mol Cell 30, 415-25.